Gunung Batu Puteh is situated in Kuala Woh, Tapah , Perak . Batu Puteh is one of the higher mountains and is rather preserved, as the trek is not too badly spoilt. The thing I have noticed is that on this mountain, many trekkers like to carve words and other things on the trees. Not like other mountains, where trees are usually left alone. To get to the starting point of the trek, you have to go to the Kuala Koh dam , which is a long way from the main road (the road to Cameron highlands). You will pass some orang asli villages and also pass beside the dam. There is also a public bus from Tapah , I'm, mot sure which one which takes you to the orang asli village, which is still quite far from the starting point. Perhaps you could ask for a lift from the orang asli . At the end of the road, there is a small old brick house where this Pakcik Idris lives. Pakcik Idris can help you find a guide on the spot , and they usually charge about RM 40.00 per day , excluding shelter and food. You can also leave your names, IC number and expected day out with Pakcik Idris. On the first day, you'll be trekking for about one hour on flat ground, following the river. After you cross the river (there is a unique orang asli bridge built across the river) the trek will begin to get steeper and steeper. 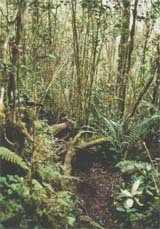 There are a lot of bertam trees as well as mosquitoes along this way, and stopping for a few minutes will set you back on your feet in seconds. Further up, there is a small stream, which is quite suitable to have lunch. The next water point will be about 2-3 hours away , so make sure you have enough water . From the water point , it is another 1.5 - 2 hours to the cave, which can be used as a campsite. The water point is not very visible and you have to climb down a bit. The water point is between some rocks, and there is only a small trickle of water . At the cave, there is a small river flowing behind it , suitable for bathing and washing. To get to the cave, you have to tee off to the left from the main trail. From the junction, it would take about 45minutes - 1 hour to get to the cave. If you are fast, there is another campsite further up, at the peak of Gunung Batu Kak, or sometimes known as Gunung Batu Puteh by the orang asli. Bear in mind that some orang asli call the real Gunung Batu Puteh as Gunung Lintang , which is further away than Gunung Batu Kak. From the water point before the cave, it is about 1.5 - 2 hrs to Gunung Batu Kak. You'll know you're reaching Gunung Batu Kak when you pass some huge boulders and the trek suddenly becomes very steep. From Gunung Batu Kak, you can see the real Gunung Batu Puteh (gun. Lintang to the orang asli) in front of you. If you look properly, you can see the metal contraption sticking out from the trees. Next to the campsite on Gunung Batu Kak , there is a small and very steep peak. I advise you not to climb this peak as it is very dangerous. Watch your step when walking around Gunung Batu Kak , because there is a cliff on one side . One wrong step, and you'll be gone. If you spent the night at the cave , take the trail behind or on the other side of the cave, which will join the main trail further up. If you take the same trail to get to the main trail, you'll have to hike back up , which is a waste of time and energy . Within 25 minutes, you should be able to reach the main trail. After Gunung Batu Kak, there is another campsite about 4-5 hours away. The campsite is rather small and can perhaps fit about 5-6 tents. There is a cold beautiful waterfall near the campsite, accessible only after going down a nearly vertical trail. The water there is simply freezing, I wouldn't even think of bathing...... There is a rather steep climb just before you get to the campsite. From the campsite, it should take about 2-3 hours to get to the peak of Gunung Batu Puteh. The peak is very big and can fit about 20 - 30 tents. The peak is not sheltered however , there are no trees to shade you. There is grass and the taller trees surround the peak, making views of the surrounding area available only to the tall guys. There is no water at the peak, so all water has to be carried from the waterfall. On the third day, you can make it back to the dam if you're quick. Sill, I presume that you'll be reaching the dam pretty late in the afternoon . A better way would be to spend the night at the cave , and head out only the next day (fourth day). If you spend the night on Gunung Batu Kak, you should be able to reach the dam comfortably early in the evening. THIS WEB SITES' URL (http://www.angelfire.com/trek/mofam) is INCLUDED in the article . PLEASE DO NOT CLAIM WHAT'S NOT YOURS AS YOURS!